Need smoothies and sauces? This 5-speed blender has you covered. It has a stainless steel blade, proprietary motor control that senses and maintains the optimal speed for blending, and a soft-start feature that minimizes splashing inside the container as it pulls food into the blade. The blending jar holds 56 ounces, so you can make milkshakes for the whole family. The five speeds are ideal for stirring, chopping, mixing, pureeing, or liquefying. Pulse mode works with all five speeds, and the ice crushing feature pulses at intervals for the best result. These are operated from control panel with LED lights for easy operation. The blender jar is made from BPA-free plastic that is resistant to damage and is dishwasher safe for easy cleaning. The lid has an integrated and removable 2-ounce cup. This blender is available in several different colors. The Ninja Professional Blender has a unique blade system. 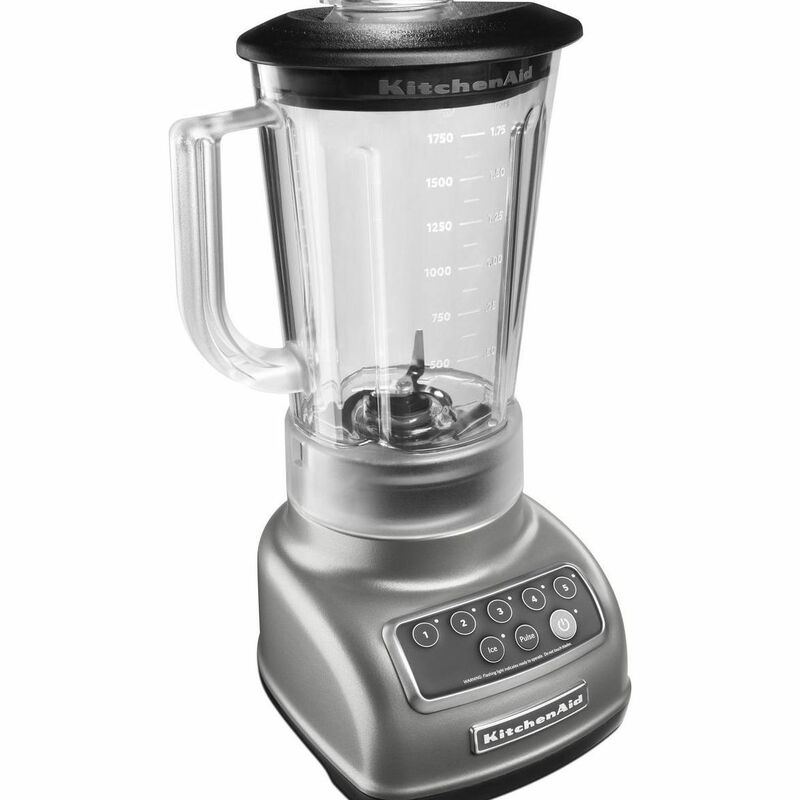 Instead of just having blades at the bottom of the blender, there is a shaft through the center of the jar with multiple blades at different heights to improve the chopping, blending, and mixing power of the blender. This blender can crush ice and puree fruits and vegetables in no time, and it includes two to-go cups so you can blend your smoothie and take it with you without having to wash an additional container. It has a 72-ounce container for high-capacity jobs, three blending speeds, a pulse button, and a button for single-serve blending. The blade assembly comes out in one piece for cleaning which makes the blender jar itself blade-free and easy to clean. As a safety feature, the blender does not turn on if the lid is not locked in place. If you need a basic blender but don’t want to spend major appliance dollars, this budget-friendly workhorse will happily make your morning smoothies. It has 10 speeds, a stainless steel blade, and a pulse feature for consistent chopping. The blender jar holds six cups, so you can make plenty for a crowd. It is made from BPA-free plastic that is dishwasher safe for easy cleaning. This has an all-metal drive that is tested to blend up to 10,000 smoothies, and it’s backed by a 10-year warranty. The controls are simple buttons, labeled for each function. This comes with a go-cup; the same model is also available without the cup. The blender is available in black or white. The Vitamix name is associated with high quality blenders for good reason, and their Professional Series 750 model is a prime example. There’s not much this machine can’t do. There are manual controls for 10 different speeds, a pulse button, and five programmed settings for self-cleaning, smoothies, hot soups, frozen desserts, and purees. This blender crushes ice to make fine “snow” and it blends silky-smooth drinks, nut butters, and sauces. The soup mode not only blends, but it heats the soup at the same time. The frozen function makes milkshakes or frozen drinks that you can slurp without worrying about ice chunks getting stuck in the straw. The programmed settings on this blender start at a low speed and increase to the highest speed for better blending, even when tackling hot soups and sauces. The blender includes a tamper that can be used even while the blender is running to scrape the sides of the jar and make sure everything hits the blades. The cleaning mode, along with water and a drop of soap, cleans the container thoroughly, so you only need to quickly rinse out the soapy water. The 64-ounce low-profile jar that comes with this model makes it easier for the blender to fit under kitchen cabinets, but larger capacity jars are also available. Bakers might want to buy the additional dry-blending container for making flour from grain or cornmeal. If you have a little bit more to spend, you can upgrade to a model that has touchscreen controls rather the dial and buttons featured on this model. The Magic Bullet is the blender of choice for multiple single-serve beverages and small households with limited counter space. This set comes with two cups and four mugs that are freezer- and microwave-safe, along with a variety of lids. Besides making drinks, it can also grind coffee and spices; mince onions, garlic, and other vegetables; whip cream; and shred cheese. Unlike models that have buttons and settings, this one has a much simpler operation—just fill the cup or mug, screw on one of the blade bases, and place it on the machine. Then press down for ten seconds or less. This set includes both a flat-blade base and a cross-blade base. The flat blade is used for blending smoothies and milkshakes, while the cross blade is used for grinding, milling, and whipping. Want to take a look at some other options? See our guide to the best personal blenders. All of the appliances on this list are capable of making smoothies. But if you want a blender specifically for the purpose of making your favorite blended beverages, then the Hamilton Beach Go Sport is probably the machine for you. It has a compact 20-ounce capacity and lacks the multifunctional capabilities of the larger blenders on this list. But that’s because it’s specifically designed to make your daily smoothie as quick and convenient as possible. The Sport Go has streamlined one-button functionality and a surprisingly powerful 600-watt motor that can easily tackle ice and frozen fruit. The best part: The blending jar is your travel bottle. This minimizes mess (no transferring your drink to a different bottle), means you only have to clean one container, and always makes the exact right amount so nothing goes to waste. Just blend, screw on the sport bottle lid, and go. There are some other personal blenders that have this same basic design, but the Hamilton Beach model comes out on top because the travel bottle actually looks and works like a normal bottle (rather than looking like a blender jar with a lid). It’s shatterproof and double-walled for insulation, has volume markings on the side, and fits in a standard car cup holder. 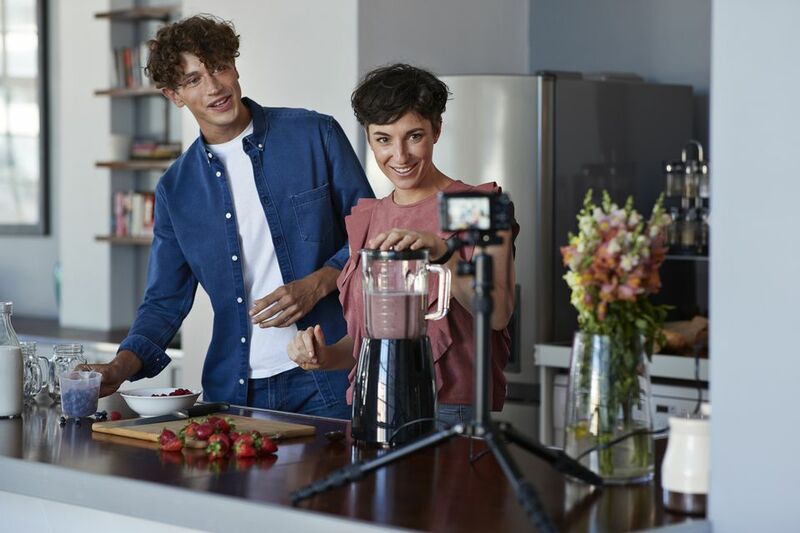 Households with larger appetites but limited counter space will love the Oster Pro Blender that includes a 5-cup food processor attachment with a slicing disk and chopping blade, a 24-ounce to-go cup for drinks or smaller volume mixes, along with a 6-cup, glass blender jar. This blender has three programmed settings for green and frozen smoothies, chopped foods (like salsas), and milkshakes, as well as low, medium, and high speeds and a pulse option. It features dual-direction blade technology so the blades spin forward and reverse for more efficient mixing. While the food processor is a great add-on, it’s not as efficient as a stand-alone food processor. However, it works well for anyone who must have a blender but only occasionally needs a food processor. Sometimes even the smallest blender takes too much space on the counter, and that’s when a stick blender really shines. The Cuisinart Smart Stick can hide in a drawer for storage until you need it. Immersion blenders really excel at blending hot foods while still on the stove, like pureed soups, refried beans, and sauces. It also can blend mayonnaise in a jar or smoothies in a cup. The Cuisinart comes in brushed chrome or multiple colors to match your décor, and it has two blending speeds which can be operated with one hand. For easy cleaning, the blending shaft is removable and dishwasher safe, and the included a 2-cup blending beaker is also dishwasher safe. ​Want to take a look at some other options? See our guide to the best immersion blenders. If you’ve coveted a high-powered blender that than even heat foods while blending, but don’t want to pay a premium price, this blender is designed to do the job without breaking the bank. This has a 2 horsepower, 30,000 rpm motor with an all-metal drive, so you won’t be stripping plastic gears. The blender jar is a full two liters, so you can make soup for the family or slushie cocktails for a crowd. Controls are simple with an on-off switch, a dial for speed, and a toggle for pulsing. The cloverleaf shaped jar is designed to feed liquid into the four saw-tooth and four ultra-sharp Japanese steel blades for efficient blending. A tamper is included so you can push ingredients down, but the lid is designed so the tamper will never touch the blades. This comes in 10 different colors, from classic to eye-popping, so you’ll be sure to find one that will look perfect in your kitchen. This includes a 24-ounce travel bottle as a bonus. Your blender doesn’t have to be a huge appliance that’s anchored to your countertop. This small, rechargeable model from PopBabies allows you to take your blending on the go. If you want to be able to make fresh smoothies at your desk, blend baby food while traveling, or fuel up on protein shakes during your next camping trip, then a portable blender might be very useful to you. This model looks like a travel bottle, and you can drink directly from the blending jar to cut down on dishes. The container is dishwasher safe for even easier cleanup. Its 16-ounce capacity is small but suited to the portable design, and it can be fully charged with the included USB cable in about three hours. As an added bonus, this blender comes with a funnel and a miniature ice tray that makes cubes small enough for the blender to handle. That also hints at the main downside of the PopBabies model: because it’s so small, it isn’t as powerful as a full-sized blender and some reviewers complain that it struggles to blend large chunks of fruit or ice.